April 7, 2016, 12:17 p.m. The podcast/audio world has been waiting for Audible to make its big move into the space. It’s here, including original content from major publishers like The New York Times, The Wall Street Journal, and Jeff Bezos’ Washington Post. By Shan Wang @shansquared April 7, 2016, 12:17 p.m. If you’ve been reading Hot Pod here on Nieman Lab or podcast news more generally, you’ll know that Audible has been staffing up with audio talent — notably from public radio — to build out original content. And you know that the podcast/audio world has been awaiting what Audible — part of giant Amazon — would bring to the industry beyond the audiobooks for which it’s been known for years. That long-anticipated original content has finally arrived in the form of a new “Channels” section in the Audible mobile app. The section, currently in beta and rolling out on iOS and Android to some Audible members now, streams curated short-form audio — ranging from read-aloud versions of New York Times articles to complete shows from PRI’s The World to episodes of Charlie Rose. 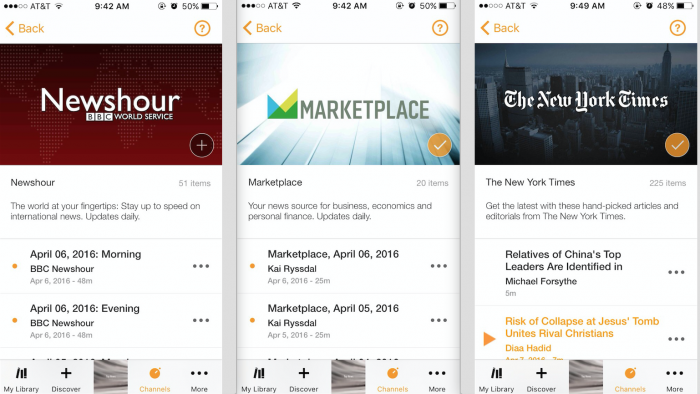 Beyond news outlet-specific streams, Audible is serving up its own multi-source collections (examples: “The Daily Rush,” “The Weekender,” “The Conversation: Guns”) which pull in relevant stories from news outlets. The “Guns” collection, for instance, includes a reading of a column by Fred Hiatt about a gun-free society. Fred Hiatt is of course editorial page editor at The Washington Post, which like Audible and Amazon is led by Jeff Bezos. Post content gets high billing in Audible Channels, but seemingly not any higher than other outlets like the Times and The Wall Street Journal; the top-level offerings are in alphabetical order. Also, there are plenty of other non-news offerings in Channels — readings of sad Anton Chekhov stories, comedy mixtapes, and more. We’re focused here just on the news bits. For publishers who are already producing audio, linking up with Audible seems relatively straightforward: PRI, for instance, started working with Audible on this initiative last year, and is now delivering its daily episodes of The World and some individual story segments from the program through an RSS feed, according to PRI’s senior director of digital distribution Morgan Church. Short-form content in the Channels section is selected by Audible editors; text-based stories are read by a voice artist (“I’m Christy Burns, reading from The New York Times U.S. section”). “To be honest I was going to cancel my subscription next month but I really like the idea of channels,” wrote Reddit user Karmometer. An Audible representative replied to note that Channels content won’t include full audiobooks but would instead usually be content between a minute and an hour long. The most basic-level Audible membership costs $14.95 a month; the new content streaming in Channels is free and unlimited for members. These large players will be concerned about getting new audiences and making sure that existing audiences come to the app every day and linger on it for longer and don’t go off to someone else’s app. I would expect that news will become an essential part of this competitive strategy. News shows won’t build that catalog, while evergreen shows won’t have immediacy and a reason to return to listen right now. So, a slate of shows that includes evergreen shows (including substantive ones, like Planet Money, that help listeners understand the news) alongside a daily news show — with a passionate, smart, engaging host and great, substantive and compelling produced content — will be a compelling mix and will be no slouch. POSTED April 7, 2016, 12:17 p.m.
Wang, Shan. "Audible, long known only for audiobooks, is branching out into podcasts — and news." Nieman Journalism Lab. Nieman Foundation for Journalism at Harvard, 7 Apr. 2016. Web. 20 Apr. 2019. Wang, Shan. 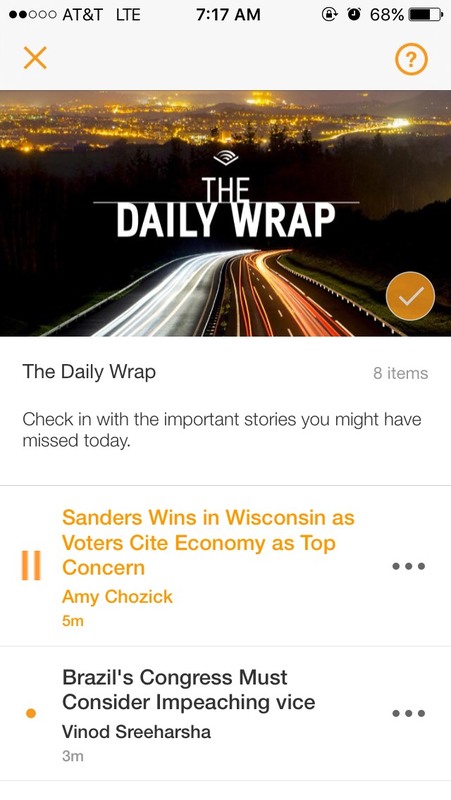 "Audible, long known only for audiobooks, is branching out into podcasts — and news." Nieman Journalism Lab. Last modified April 7, 2016. 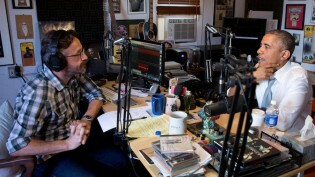 Accessed April 20, 2019. https://www.niemanlab.org/2016/04/audible-long-known-only-for-audiobooks-is-branching-out-into-podcasts-and-news/.